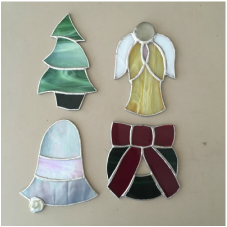 This one day fused class is a great way to add a little light to your day. These cute night light can brighten any room. You start with a base and add your glass embellishments to create your night light. No experience required. No glass cutting required. Dates: 12/2, 12/3, 12/9 Time: 11am Price: $26 Party rates available for groups of 8 or more. Cost: Large $80. Small $60. Enjoy making this adorable stained glass turkey. Small or large sizes available. Bring your friends/family, food and drinks and make it a party. All materials included. No experience necessary. ​The Holiday Season is fast approaching. Many people overloaded with parties and shopping during the holiday season so now is the time to schedule your ornament workshop. 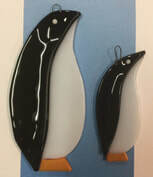 Invite your friends and family to an Ornament Party at Art Glass Studio or host an Ornament Party yourself. Bring your favorite holiday treat or appetizer and the recipe to share. Pictured are a few of the favorites, but there are many other options to choose from. No experience necessary. No class cutting required. Date: Dec 2, Dec 7 Time: 11am or 6pm-Thursdays only. 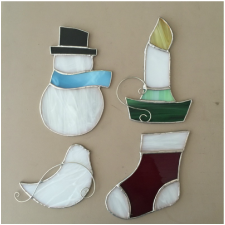 Make your all friends and family envious with these cute stained glass ornaments. Also available for purchase. Invite your friends and family to join in the fun. Includes all materials. No experience necessary. No class cutting required. Party price with groups of 8 or more. ​Create your own Fall or Winter plaque using cutouts, frit, noodles, stringers and other glass elements. This is a great party project. No glass cutting required. No experience necessary. Create this lovely dish in honor of love all year long. Your dish can be red and white or clear. You can choose purple and white or clear. Pink glass is an additional charge of $10. No experience necessary. ​​Create your own one of a kind Fused Wall Plaque with your favorite pink, red, white, purple. Make one for a loved one and yourself. A piece you will treasure for ever. No experience necessary. Art Glass Studio will be having a class that includes LUCKY clovers and colors of green for St. Patrick's Day. There are several projects to choose from. Price may vary depending on the specific art project. No experience necessary. Make your favorite St. Patrick's Day project.